Winter is a very frigid time of year in the Northeast. Our attitude towards this season can fluctuate from absolute love to despise depending completely on your attitude and perspective. Many enter this season only wishing to be anywhere else but that present moment. The uncomfortable cold weather can be hard to appreciate, but once we do, so much potential opens up. Our perspective on the matter can literally change the way we feel. Let us appreciate all it has to offer instead of wishing we were somewhere else. This is the essence of gratitude, enjoyment, mindfulness, and appreciation; to be in the present moment and feel everything there is to feel about it. During the winter months, we can appreciate the beauty of a snow-covered landscape. It is simply breathtaking. Everything becomes quiet. All life has hunkered down. It becomes peaceful. Over the years I have learned to enjoy the winter, not only for it’s snow, but because without death, there would be no re-birth. Spring, as we know it to be here, would not exist. Flowers would not need to bloom. The warmth of the sun would not feel as potent. And animals would not sing their joyous songs of life. In the midst of these cold winter months, we can choose to enjoy the winter wonderland it blesses us with. Or we can choose to stick in doors and hibernate for some time. Regardless, this weather forces us to slow down, to take a break from our fast-paced lives and just be. Cuddle up to a warm cup of tea, or some hearty meals to warm the body and soul. There is a reason we enjoy hot, earthy, warming foods this time of year; to help combat the cold, dry, and brisk weather out doors. Let’s embrace this weather, knowing all is has in store for us. Let’s prepare meals that will nourish and support us during this time. Oatmeal is a classic winter breakfast known to warm us from the inside out. It fills our bellies which alone is something to be grateful for. And when made with love and care, can fill your soul as well. 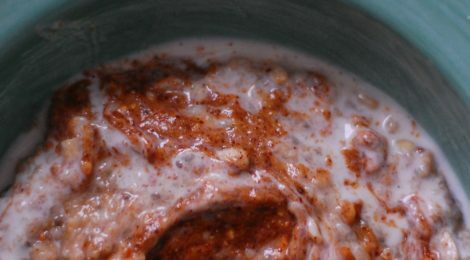 This particular oatmeal recipe is made with warming spices like cinnamon and nutmeg. It is topped with almond butter, which can easily be made at home, yogurt, and fruit if desired for a well-rounded, hearty meal. Make for your kids as their first meal of the day, or enjoy along side your other half. This recipe is made for two, and we hope you both enjoy it while the rest of the land sleeps soundly, peacefully awaiting the re-emergence of spring. 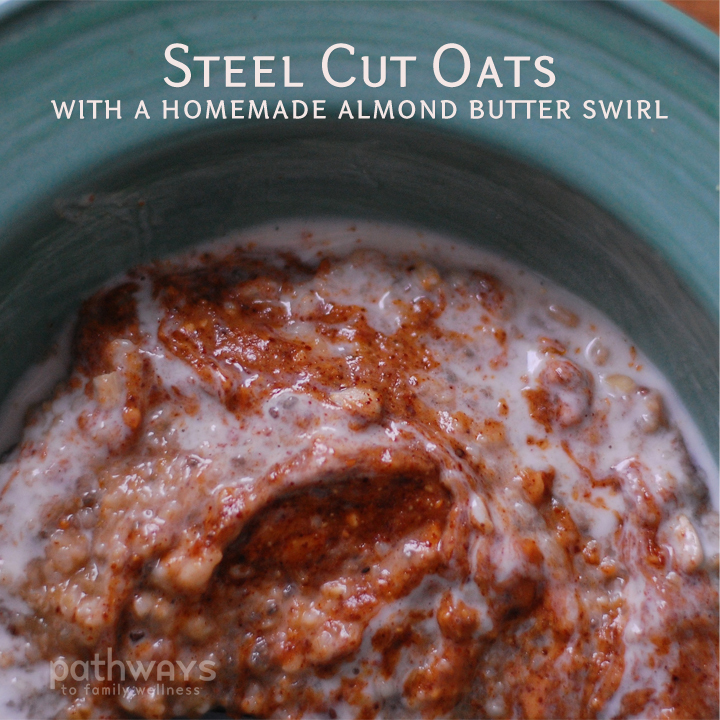 If you prefer a creamier oatmeal, grind down your raw steel cut oats a bit in a coffee grinder first. If not, skip this step. Bring milk to a boil in a small sauce pot. Add steel cut oats, vanilla, cinnamon, nutmeg, and sea salt and bring back to a low boil. Simmer for about 10 minutes, and turn off the flame. Cover and allow to sit for another 10 minutes while you prepare your toppings. Add chia seeds to your oatmeal mixture and mix well. Pour oatmeal into a bowl and top with yogurt, almond butter, and/or fruit of choice and enjoy immediately. Preheat your oven to 350°. Spread your almonds on a baking tray and bake for 10 minutes or until they are golden. Allow to cool. If you would like raw almond butter, skip this step. Combine your almonds and salt in a food processor and blend for 10 minutes or until it becomes creamy*. *If you want crunchy almond butter, save about 1/2 of the roasted almonds off to the side and add to your food processor at the very end after it has already become creamy. Pulse a few times or until it becomes your desired consistency. Recipe courtesy of the Bare Sprout.